Dogs love the beach. Cats… maybe not so much. But regardless of what kind of furry friend you have, they can all be vulnerable to harm from UV rays just like humans are – especially on exposed skin, such as their nose. How can you keep your pets sun-safe? Boop those snoots with a big blob of pet-safe sunscreen to stop their skin from suffering UV damage which can cause painful burns as well as lead to skin cancer. Are pet sunscreens specifically tailored to cats and dogs, or are they just hawking regular old sunscreen at a higher price to take advantage of animal lovers? 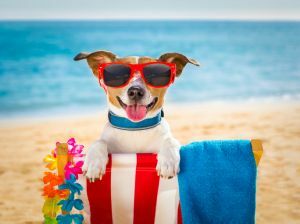 Read on to find out what the deal really is with pet sunscreen, and how you can keep little Fluffy sun safe this summer. Animals can be vulnerable to UV damage just like us. As with humans, the UV risk to your pet varies based on skin type and sun exposure. 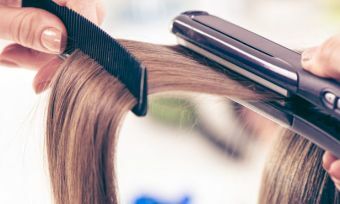 For example, long-haired animals such as Huskies have far more hair shielding their skin than a short-haired Chihuahua. One thing all dogs, cats, horses, and other furry friends have in common, however, is that there’s no hair protecting their nose. Other areas particularly susceptible to UV damage include ears and muzzles, but anywhere where skin is exposed to the sun can benefit from protection. What kinds of pet sunscreens are available? Doggy Sunwipes (sunscreen wet wipes), which can be rubbed onto the ears, nose, muzzle, pink skin area, and across the entire coat where necessary (i.e. light coloured or short haired dogs). Doggy Sunwipes come in packets of 20 wipes, for around $10-$15. Doggy Sunstick is a stick sunscreen that can be rubbed on the ears, nose, muzzle, pink area, and anywhere else where skin is exposed to the sun. 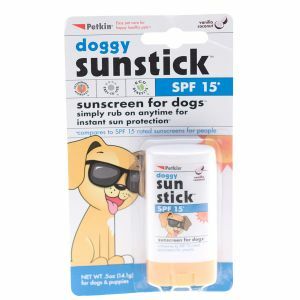 Doggy Sunstick comes in a 14g tube, usually priced around $13-$19. Doggy Sunmist is a pump spray sunscreen that can again be easily applied to any area which requires sun protection. Watch out for your dog’s eyes though! Doggy Sunmist comes in 120mL spray bottles, priced around $13-$18. 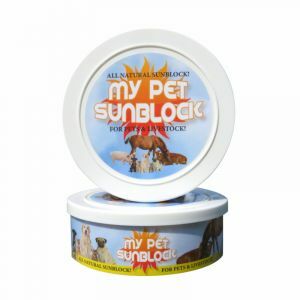 Made from titanium dioxide and zinc oxide, the brand claims that My Pet Sunblock is safe for horses, dogs, cats, cows, pigs, and all types of animals with white-hair and pink unpigmented skin. It’s described as an ‘all-natural’ sunscreen, which can be applied dry (as a thick powder) or damp (to form a paste). My Pet Sunblock is water rain resistant. A 170g tub retails for around $45. Made of edible oils, Dr Zoo sunscreen is suitable for dogs, cats and horses. The formula is based on titanium dioxide, rather than zinc oxide. It is recommended for application on animals with light coloured noses, thin or missing fur, or who just enjoy sunbaking on their backs with their bellies exposed. Dr Zoo pet sun cream comes in a 120g tube, priced at around $15-$20. This brand is famous for their dog goggles for fashionable, functional eye protection for dogs going about their day in the sun, sticking their head out of the window on a car ride, or buddying up on your motorcycle. It stands to reason that they’ve since branched out to offer dog sunscreen (as well as other functional outdoors gear for adventurous pups). 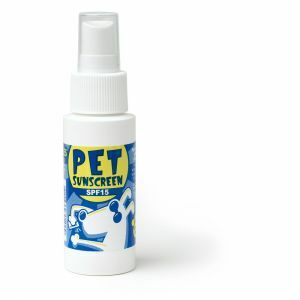 Doggles Pet Sunscreen is a pump spray, with a choice of Original Unscented or Tropical Scent. It’s labelled as equivalent to SPF 15, in a non-toxic, non-oily, non-irritating, water soluble formula suitable for application on both skin and coat. The 60mL pump spray usually costs around $15-$20. Unlike other pet sunscreen brands, Aniwell labels its pet sunscreen as SPF 29-33 (blocking around 97% of UV radiation). It also functions as a second skin to protect injuries from bacteria, as well as the sun. Filta Bac allows wounds to breathe while healing, keeping in moisture and keeping out dirt. The formula is suitable for wounds, existing sunburn, and irritated skin as well as for use as a sunblock. A 120g tube costs around $13-$19, while a 500g tub costs around $31-$45. Is sunscreen safe for pets? There are a few reasons why there are special sunscreens for pets, and why you should be very careful about applying human sunscreen to your dog’s nose. Common ingredients in human sunscreen can pose a significant health risk to animals. Zinc is toxic when consumed in large doses. The risk of poisoning from accidentally ingesting zinc oxide from sunscreen depends on the concentration of zinc in the sunscreen, as well as the size of the animal (with smaller pets being even more vulnerable). Symptoms of zinc poisoning in your cat or dog include vomiting and fatigue in the short term, with further symptoms developing in the subsequent hours or days including diarrhoea, depression, pale or yellow gums, eyes, or skin, dehydration, and orange-tinged urine or feces. Naturally, if you suspect that your pet has consumed zinc you should take them to the vet immediately for diagnosis and treatment. The longer the delay before treating any poisoning, the more serious the harm and the harder it is to treat. Salicylates are found in some sunscreens and are particularly dangerous for cats, so pet sunscreens do not contain these. That being said, it’s uncommon for salicylates to be present in sunscreen in sufficient concentrations to pose a big risk to pets. PABA can also lead to serious organ damage in pets, but most modern sunscreens are free from PABA anyway as they can irritate human skin. Sunscreen isn’t a panacea for your pet’s sun safety. Pet sunscreens tend to be lower SPF than those available for humans, and are logistically a bit trickier. It can be licked off, and that’s after you manage to get it rubbed in to all the right places. While it won’t completely stop UV damage and it will need regular reapplication to maintain maximum protection, doing everything you can to keep your family safe and healthy is always worth it. Pet sunscreen is one more layer of protection that may make a difference to your furry friend’s health. How can I keep my pet sun safe? 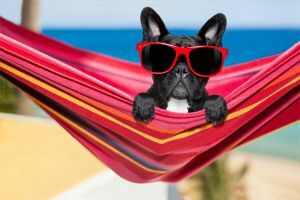 Similarly to humans, a holistic approach to sun safety is best – limit sun exposure during the middle of the day (when UV radiation tends to be strongest), provide plenty of shaded areas to relax, and keep them inside on days when the UV rating is very high. Sunscreen can be handy for those dogs that just refuse to stay in the shade and absolutely must run around enjoying their day in the sun. Sunscreen isn’t the only tool you can use to keep little Mittens or Rex safe from the sun. Dog sunglasses and goggles can protect their eyes from UV damage, as well as keep them protected from dirt and wind during car or motorcycle rides. Rasher shirts can be more reliable to protect skin from sun, especially if your pup is splashing around in the water or digging around in the dirt, both of which can wear away sunscreen. For a longer-term measure, you can have your home’s windows tinted to reduce UVA and UVB radiation into your home – an extra layer of protection for both the human and animal members of the family. Sunscreen can be uncomfortable for pets and inconvenient to keep reapplying, especially if you have a wriggly pup or uncooperative cat. The same can apply for goggles and clothing. 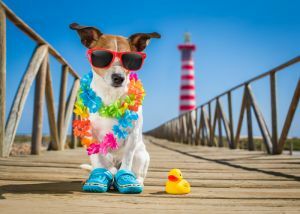 If these aren’t working, explore more ways to protect your pet from the sun without causing them distress or discomfort.